IL-71 - Bacon Farmer Workman Engineering & Testing Inc. This project includes Phase I and Phase II engineering services along with an Environmental Assessment to widen a two-lane roadway to two travel lanes in each direction throughout the entire length of the project. 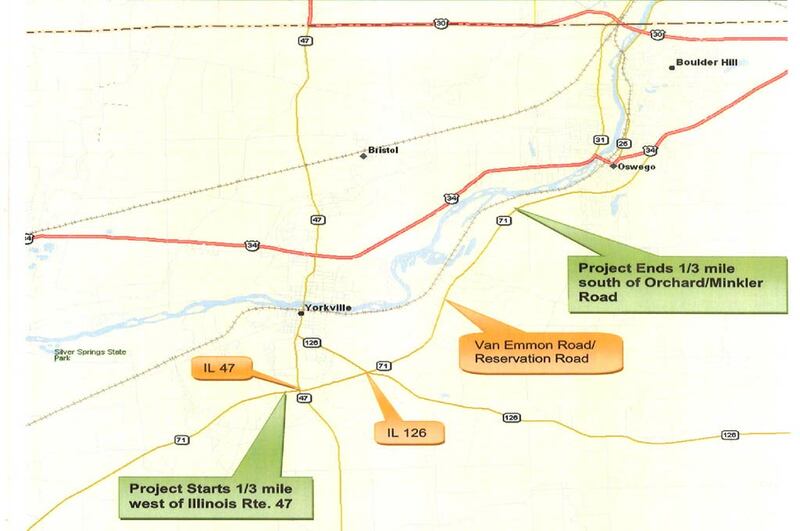 This project will increase capacity and reduce congestion on 5.6 miles of IL-71 from IL-47 to Orchard Road, west of Oswego, Illinois in Kendall County. The project is identified to include Context Sensitive Solutions (CSS). The project is to incorporate access management principles at existing intersections and mid-block openings. U-turn designs are to be considered. A multi-use path will compliment this design the entire length of the project. A 22 feet two-way left turn lane will be designed on a portion of this section to access existing developments. The scope of services includes widening of one bridge and three box culverts. Phase I work will include surveys, crash analysis, intersection design studies, traffic analysis, preparation of the combined design report, environmental assessment, bridge condition reports, type size and location drawings, air, and noise analysis, drainage studies, pavement analysis, cost estimates, and public involvement. Phase II work will include the preparation of structure plans and preliminary and final contract plans.